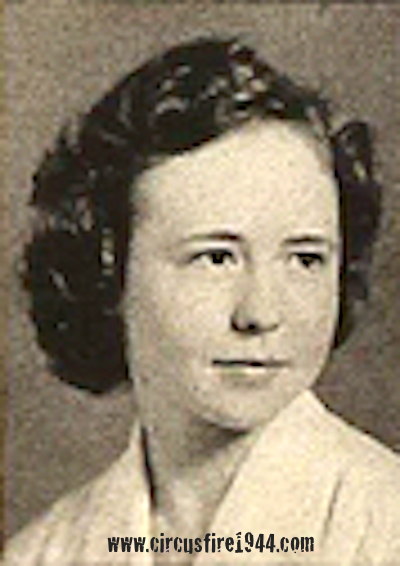 Mrs. Elizabeth Josephine (Burrows) Goulko of 95 Monticello Terrace, Great Kills, Staten Island, New York, was born February 10, 1922 in New York, daughter of New York natives Elizabeth (Lake) and Joseph C. Burrows. She was found dead at the circus grounds after the fire on July 6 and was buried at Valhalla Beautiful Cemetery, Staten Island, after services at the Ahern Funeral Home. She leaves her father, of Staten Island; her husband, Lt. Burton T. Goulko, 25, serving with the 90th Infantry Division, U.S. Army; her sister, Mary Louise, 20; and her brother, James, 16. Elizabeth's body was identified at the State Armory by her father, Joseph Burrows, on July 7. 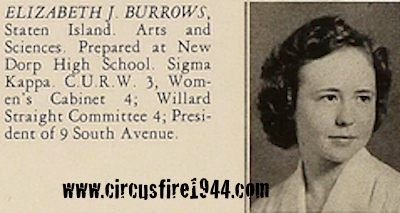 She attended the circus with her mother-in-law, Mrs. Ann Goulko, and sisters-in-law, Claire and Nancy, of West Hartford, with whom she was visiting. All were burned and died on scene except Claire, whose fight for life ended on August 17, 1944. The estate of Elizabeth Goulko was awarded $10,000 by the arbitration board. Elizabeth was a graduate of Cornell University, class of '43, and married class of '42 Cornell graduate Burton T. Goulko on June 5, 1943 while Burton was stationed at Fort Sill, Oklahoma. On August 20, 1944, Lieutenant Burton T. Goulko was killed in action in France while fighting with the Allied armies. He was posthumously awarded the Silver Star for conspicuous gallantry versus the enemy. Memoirs of a soldier who served with Lt. Goulko indicate that Burton was quite despondent in the weeks that followed the news of his family's death in the fire.